You've got to admit that the Shadow NanoMAG pickup (above) is cool. 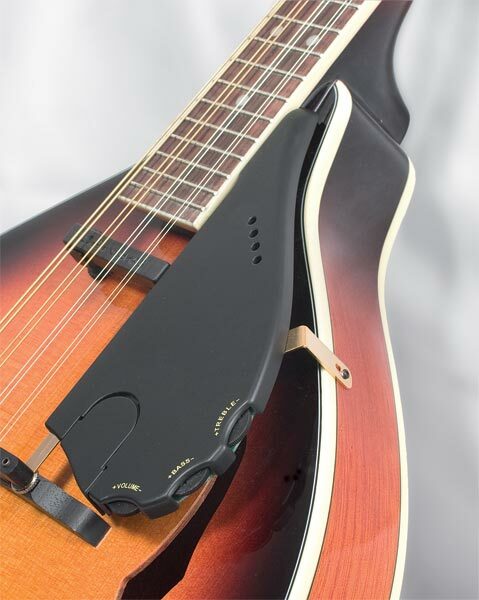 It's a 4-pole floating magnetic pickup with built-in EQ, so you can set a separate level for each string pair on your mandolin in order to balance the output. If this actually works, it could be one solution for the "weak E" problem that plagues so many mandolin pickups. The pickup element is attached to a pickguard that incorporates three control dials: one for volume and two for tone. Finally, there's a 1/4-inch endpin jack. So other than possibly needing to widen the tailblock hole for the jack, and drilling a screw hole for the pickguard support if you don't already have one, you should be able to install the NanoMAG without modification to the instrument. Below is the Shadow SH926 piezoelectric mandolin bridge, which comes with a volume-control unit. The company also makes magnetic single-coil pickups for bouzoukis. Check out the Shadow Web site.